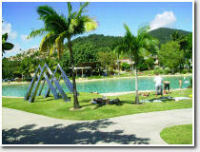 3 day 3 night sailing adventure to the Whitsunday Island and Outer Great Barrier Reef. 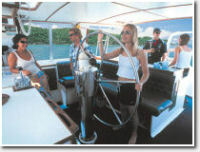 There are few sailing trips go to the Outer Barrier Reef and suitable to all guests. Anaconda III is one such vessel. She is the second largest vessel operating in the Whitsundays and is 101ft in length and takes a maximum of 32 passengers on board. Anaconda III is no maxi yacht, she is a mega yacht. 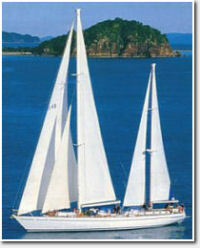 Which makes her the largest sloop sailing vessel cruising the Whitsunday waters. Due to her size, Anaconda III has an advantage over most other yachts, as she is surveyed to visit the outer Great Barrier Reef. 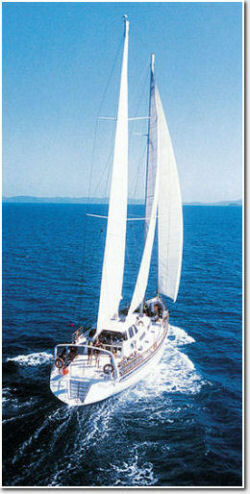 This is an adventure only a very few sailing boats in the Whitsundays can offer. This cruise will take you to all the highlighted areas of the Whitsundays from Whitehaven Beach, the national park islands for bushwalks/games and pristine snorkelling/diving locations on the Inner and Outer Barrier Reefs. This fantastic cruise offers many treats, snorkelling, sailing and scuba diving, guaranteed to get any intrepid traveller excited. Anaconda III offers you the best possible and most affordable way to enjoy 3 days and 3 nights visiting both the beautiful Whitsunday Islands and the spectacular Great Barrier Reef. The vessel is fully air conditioned throughout, offering share cabins, private double and private twins, Anaconda III has a room to suit most people.